Diatribe is a weekly opinionative column by Dean Kalimniou, which is published in Melbourne's Neos Kosmos English Edition Newspaper. It deals generally with issues of interest to the Greek Community in Australia. From the voyages of Odysseus to those of Jason and the Argonauts and Alexander of Macedon’s demented attempts to rule the ends of the Earth, it cannot be disputed that ancient Greeks were afflicted with a great wanderlust, a burning desire to probe the very ends of the Cosmos and discover the ends of their world. It was this wanderlust, coupled with social and economic crisii that caused the Greeks to found colonies throughout Asia Minor and the Black Sea. Pytheas, living in the fourth century BC, was a direct product of wanderlust. His was a world of commerce and the fringe, born and raised in Massalia, a Phocaean colony upon the borders of the ‘civilised’ world, nowadays the important French port of Marseilles. Today his bust is framed in a temple-like niche in the façade of the Marseilles Bourse, along with his compatriot Euthymenes, who is said to have explored the west coast of Africa as far as Senegal. Pytheas on the other hand, is said to have sailed north, bringing back tales of the tin-producing lands (Britain? ), islands where amber was washed up by the sea (the Baltic Coast?) and in the far, far north, Thule (Iceland?) where the ocean waters congealed. Where if anywhere Pytheas actually journeyed to, has been the subject of heated debate throughout the centuries. Later Greek commentators expressed incredulity at his claims, conflicting as they did with pre-existing notions of geography and natural phenomena. Nevertheless, Pytheas occupies the place of honour high on the front of the Bourse, heavily cloaked against the northern cold, survey gear in his left hand and a beefy right arm folded across his body in a stance of aggressive protection as he stares steadfastly into the distance, out to sea. A charlatan or a heroic adventurer? A mere collector of anecdotes or an original observational scientist? No one will ever no for sure. Pytheas documented his epic voyages in his lengthy tome «Περί του Ωκεανού,» (On the Ocean.) Unfortunately, this volume was destroyed with the burning of the Great Library of Alexandria This notwithstanding, it was quoted by at least eighteen other writers over the next 900 years. How many of them actually had access to the original text or were quoting from secondary sources is unknown. It is certain however, that like a game of Chinese whispers, Pytheas’ original observations appear to have become garbled and misunderstood, when viewed through the prism of modern science. Or such is the interpretation of those who believe. At any rate, when On the Ocean was published about 320BC, it must have been a shocking book. The Greeks knew virtually nothing about what lay beyond the Pillars of Hercules (Gibraltar). They knew that Europe faced the Ocean which circled the world. They also knew that from somewhere along these mysterious badlands came tin, amber and gold. Yet neither were most Greeks concerned about what lay beyond the boundaries of the Mediterranean world – the lands of the barbarians people so backward they could not even speak Greek but brayed like animals. Pytheas may well have been the first Greek to be curious enough to travel among the ‘barbarians’ to the limits of the inhabitable world and to publish a description of what he saw. The scraps that survive of Pytheas’ account are the earliest descriptions we have of Brittany, the British Isles and the eastern coasts of the North Sea. It is not difficult to speculate on what excited Pytheas’ interest in the north. In the fourth century, Massalia was not only a Mediterranean trading hub, but also a main artery of trade with the Celts of France. Greek amphorae and crafts have been found throughout the length of the River Garonne. In exchange, the Celts would have traded tin and mysterious amber, along with strange tales of the amber rich, tin producing northern isles. It was enough to tantalize any intreprid explorer. Polybius, a Greek historian writing a century after Pytheas, noted that Pytheas, not a wealthy man, must have depended on the patronage of a wealthy Greek merchant to acquire, outfit and provision his ship. That merchant was undoubtedly interested in tin ("kassiteros" in Greek) which, when blended with copper, produced the highly prized and valuable bronze. For centuries, the Kassiterides Islands (British Isles) were well known to the Phoenicians as a principal source of tin. Herodotus, the ancient Greek historian (484-425BC) had reported that their boats sailed through the Pillars of Hercules (Straits of Gibraltar), then north along the coast of France to an area now known as Cornwall, England. Pytheas decided to find these islands on his own, to locate the fabled sources of tin and to search for new deposits. While, ostensibly, his purpose was to bring back a load of tin for profit, Pytheas had the heart and mind of a true explorer. He was curious to see and visit the islands, of which he had heard rumours, to explore what lay beyond and to return and tell the world of his findings. Luckily for us and for his future posterity, Pytheas was possessed of two attributes that allow us to verify his claims. First and foremost, because of his training as a mathematician and astronomer, Pytheas had acquired the important discipline of observing and recording his findings. Second, as a ships navigator, he had mastered the use of the "Gnomon," an instrument described by Herodotus, borrowed from the Phoenicians, and brought to Greece during the sixth century by Anaximander. With the Gnomon, ancient navigators were able to navigate away from the sight of land and to perform astounding calculations. 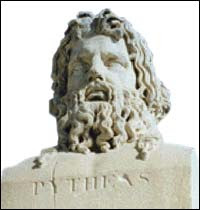 Pytheas was the first person we know by name to have used it to calculate the latitude of Massalia, which he found to be 43' 1 I' North, almost matching the true figure of 43' 18'North for modern day Marseilles. The ability to record the precise location of different sites along his travels proved invaluable to him, helped him to establish the accuracy of his log, and provided the proof needed for modern day historians to confirm his writings. In order to avoid the Phoenicians who had blockaded the Mediterranean, Pytheas is held to have sailed, for five full days from Massalia to the Pillars of Hercules before turning north to the Kassiterides Isles. But did he. Why waste time circumnavigating the Iberian Peninsula in fear of a hostile force? Strabo, the ancient geographer records the scientist Eratosthenes as quoting Pytheas’ work in stating that the northern parts of Iberia (Spain) offer easier passage to Keltiki (France) than if you sail by the Ocean.” On the balance of probabilities., it would seem that Pytheas trekked across France. Arriving at Burdigala, Pytheas is likely to have looked for native transport to take him northwards. For this next stage of his journey, we have some geographical precision, though in a garbled form, quoted by Strabo. The essence of what Pytheas seems to have recorded in his original book is the existence of a long westerly projection of the European mainland, a «κύρτωμα» or ‘hump’ “of length not less than 3,000 stades.” At its Atlantic extremity there were “various promontories, as well as islands of it, the farthest, Ouexisame, lying three days sailing away.” Strabo believing this not to conform with his preconception of European geography, dismissed these observations as fabrications. Yet the real geography is not is doubt. The ‘hump’ must be Brittany, in which case its westernmost island is likely to be Ushant, a vital marker for anyone navigating the dangerous coastline of the region. How long Pytheas stayed in Brittany is unknown. Greek-style columns have been found in the north of France and it is tempting to make a link…More likely, these are locally produced items, inspired by what Celtic traders would have seen in their contacts with the Masssaliot Greeks. Archaeological investigation has revealed intensive tin mining in ancient times on the promontory of Cornwall and especially on Mount Patten in Plymouth Sound. Joined to the mainland today by a low-lying narrow coastal strip, it appears to have been an island in ancient times and the range of Late Bronze Age artifacts found within it and the many artifacts of Aquitanian (southern France) leads many scholars to believe that it was Pytheas’ trading island, Ictis. It must have been a time of great excitement for Pytheas at last to arrive at the source where the tin he had heard so much about was extracted. If the Sicilus text is correct, it appears he obtained a detailed, firsthand knowledge of its processing. Polybius, in his Geography quotes Pytheas as reckoning the perimeter of the island to be 40,000 stades. This would work out at 7,400km, remarkably close to the length of the British coastline given in the Encyclopaedia Brittanica as being 7,580km. This remarkable feat of calculation must certainly lend credence to Pytheas’ claim, dismissed so contemptuously by Polybius that he “traversed the whole of Britanniki by foot.” Furthermore, in order to take such accurate measurements Pyrtheas must have sailed around Britain. One of his calculations of latitude survives in the works of Hipparchus as 54˚ 14΄, roughly around Scarborough in northern Britain and another, around the island of Lewis in the extreme north of Scotland. Further, he records journeys to the Orkneys island where he records tidal waters swelling to a height of 35 metres, a phenomenon created by low barometric pressures that still exists today. Excavations on Orkney and Stromness corroborate Pytheas’ descriptions of ancient British life. Julius Caesar centuries later was impressed at the versatility of British war chariots and the fragmentation of Britain into small kingdoms is well attested in Celtic mythology. All types of events and strange stories were reported by Pytheas. One such "incredible" story, which he reported, told him by the inhabitants of northern Scotland, was about the presence of a place to the north where there were only two or three hours of night during parts of the year, and another place even further north where the sun shone all night long. This was at Thule, in the extreme north, which scholars conjecture must have been Iceland. Before the readers makes glottal sounds of incredulity, it should be noted that Roman coins have been found in various parts of Iceland and that there are records and archaeological evidence of Irish monks travelling to Ireland before the seventh century AD. Their technology was of no greater sophistication than those of the Massaliot Greeks. Nevertheless, while stating that Pytheas believed Thule to be the last place on earth to be inhabited, Strabo categorically states in his Geography that he was a liar. Yet the evidence compellingly inclines to the opposite conclusion. Travelling north from Scotland, Pytheas encountered a cluster of small islands where he reported seeing large, boat-size fish, lazily swimming on the surface and loudly blowing out sprays of water. Incredibly as this may have been to Pytheas and his crew, who had probably never seen a whale before, such pods of whales are common to those waters. He reported sailing six days northwest towards Iceland (Thule) where he encountered dense fog described as so thick and eerily quiet that the ship and the sea seemed suspended in a void. He recorded the presence of water and slush ice that "binds all together, and can be travelled neither on foot nor by boat". This condition would not permit him to go further and forced him to turn back. He also noted , as is recorded in Pliny’s Natural History, that the areas of the extreme north had protracted periods of light and darkness, being so near to the North Pole. This, not only tends to indicate Pytheas actually was in Iceland, but also an understanding that the world is spherical in shape, an idea developed by several Greeks at this time.
. On his return journey, Sicilus and Timaeus record Pytheas as having landed on a vast promontory- Abalus. Here “the sea throws up a quantity of amber that appears nowhere in the world.” Pliny also describes Pytheas as explaining how amber is formed. His highly detailed account could not have been made unless he had spoken with the natives and seen for himself how the substance was collected. On the basis of his observations, scholars speculate that he must have landed in Jutland, Denmark, a noted amber producing area. No one will ever know what homecoming Pytheas received when he returned home. Did he launch on more epic voyages or remained at home, recounting his exploits in sailor’s taverns ad nauseum? What is known is that despite the incredulity of many scholars and geographers of the time, Pytheas’ On the Ocean soon became a classic, used by diverse authors, including Apollonius of Rhodes who used Pytheas’ account to write his epic poem Argonautika. His astronomical observations in the North Sea were quoted with approval by the father of heliocentric cosmology, Eratosthenes. The ancient authors record Pytheas as also having written a book on underwater activity in Sicily’s Aeolian Islands. An ancient Jacques Cousteau he must have been entranced and enthralled by the science of the Sea, the first of many who dared to be different and whose achievement was so vast that it could never lapse into obscurity.